The sport of MMA is still very much reliant on the entertainment value as the sport is still continuing to grow and cement itself alongside the other major sports around the world. In a sport that rewards personalities with the popularity and notoriety of the fan base, it isn’t a surprise that FIT NHB’s Tim Sosa is one of the more recognizable names on the regional circuit. Known as possessing one of the most unique and attention grabbing nicknames around, “Timbo Slice” was one of New Mexico’s most successful and documented amateur mixed martial artists. Sosa notched over ten victories as an amateur in fifteen outings while winning the King of the Cage Amateur Title during that time. Being the featured fighter on several occasions in Santa Fe, Mescalero, and Cortez, Colorado, Sosa’s exposure has been more extensive than your typical amateur fighter. When Sosa made his professional debut in 2013, he had seen 27 rounds of action and was considered one of the top prospects in the area. Sosa would lose his pro debut against another top prospect, Jordan Espinosa at XFC 25 in September of 2013 and for the first time in his combat career would look at an upside down record. At 0-1, Sosa would have to go back over four years to when he was 1-1 to recall the feeling of not having an exceptionally successful record. 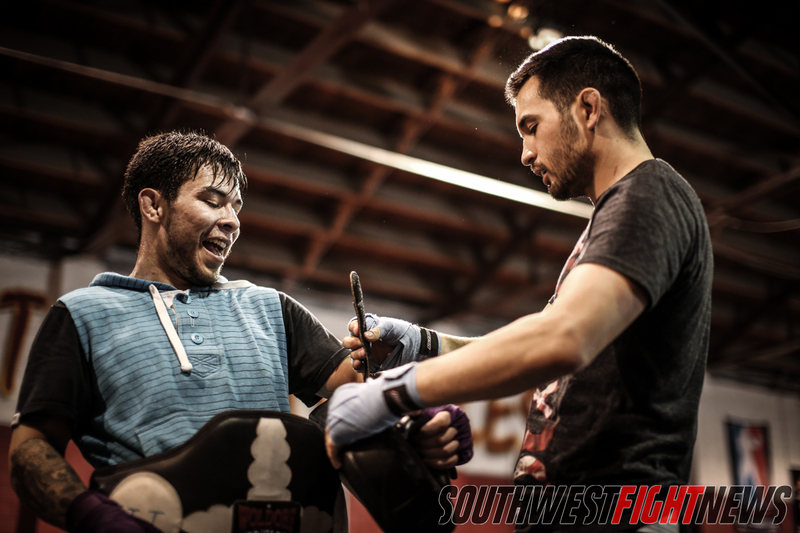 “Timbo Slice” (right) is seen working with UFC Flyweight Ray Borg (left) at their home gym, FIT NHB. The two Flyweights are not only teammates, they are also friends. Sosa used the experience of cornering Borg in the UFC as a measurement of where he sees himself going in his career. Success would elude Sosa in his second professional outing as he came up on the wrong end of a split decision under the Rocktagon MMA banner against Alan Lerma. While the judge’s decision was controversial and disputed, Sosa was 0-2 and the pressure had been placed upon him to get on the winning track. Now staring up through the 0-2 hole, Sosa had to re-evaluate a lot in his life and included in that reflection was the idea that fighting may not be his calling. While fight fans knew of his talent and saw much of his success, the idea of going 0-3 in his professional career was a hole he didn’t plan on digging himself out of. Fate wouldn’t play that card against Sosa as redemption would come in the form of a much-needed victory, the first of Sosa’s professional career in a rematch against Lerma. Sosa would dominate early and notch the TKO victory seconds before the end of round one. The urgency of Sosa could be seen inside the cage as he was poised, focused, and aggressively desperate to have his hand raised. Now two months since that victory, Sosa is slated to step into the cage with Zac Riley (1-1) of Pueblo, Colorado. The two Flyweight fighters have a lot on the line in terms of their career trajectories as both will enter the cage with tremendous stakes on the table. A win for Sosa means he rights the ship and brings his record back to .500 where it is possible to move forward with a clean slate. Riley, coming off his first professional victory could drop below the .500 mark with a loss erasing all momentum from his 26-second submission victory three months ago. Representing Albuquerque’s FIT NHB gym, Sosa has the hometown advantage heading into the Albuquerque Convention Center. A very tactical striker with savvy submissions, Sosa will be the first pro fight on the evening’s line-up. While his sights are set on Riley and the September 12th Resurrection Fighting Alliance event, Sosa is prepared for a successful career after already overcoming significant obstacles in his career. The chance to make waves comes against Riley, who is the teammate of the main event fighter Matt Manzanares. Riley is no stranger to the amateur ranks himself, owning eight amateur victories in ten outings. Riley will definitely be a stiff test for Sosa but if the Albuquerque trained fighter wants to revamp his trajectory a win on AXS TV will be a huge step toward that goal. Tickets for the event can be purchased from your favorite fighter listed on the fight card including “Timbo Slice” himself, or visit the Hold My Ticket website (https://holdmyticket.com/checkout/event/180510). The event is set for this upcoming Friday, September 12th, inside the Albuquerque Convention Center.